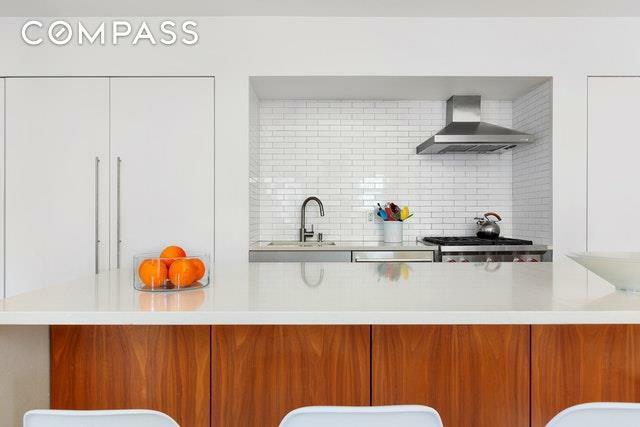 This spectacular, rarely available 3 bedroom, 2.5 bathroom loft condominium is a perfect combination of expansive space and a minimalist aesthetic. 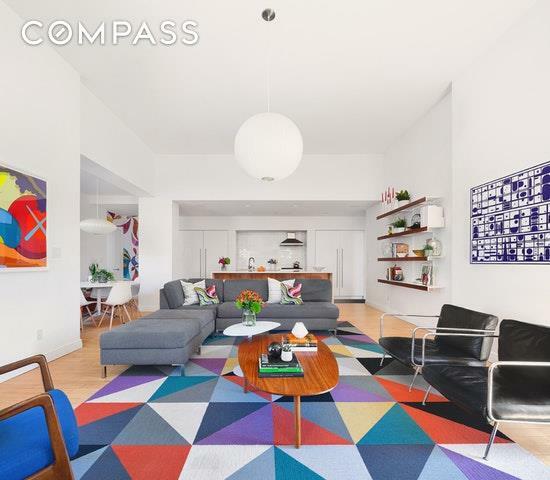 Located on the charming, cobblestoned Tiffany Place situated between Cobble Hill and the Columbia Street Waterfront District, this renovated, architect-owned home boasts incredible natural light, high ceilings and multiple private outdoor spaces. 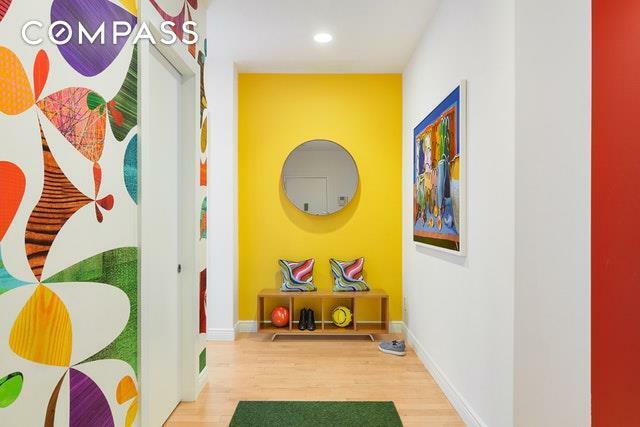 You enter into a gracious foyer, perfect for hanging jackets and stowing keys and shoes. There is a pretty powder room and coat closet as well. This wing of the property features two spacious bedrooms with tons of closet space and a full bathroom. They share an approximately 150-square foot western-facing balcony. Continue into the enormous great room with dining nook and open kitchen and take in the 12-foot ceilings and brilliant sunlight streaming in from the north, south and west. This amazing entertaining space has beautiful custom built-ins and two outdoor balconies on the north and south sides. The kitchen highlights include a large Caesarstone island and countertops, vented Wolf range, Bosch dishwasher and Thermador refrigerator. Careful consideration and attention was given to storage. There is ample space for the vented washer and dryer, a pantry and loads of shelving behind custom millwork. The master bedroom features direct terrace access, a walk-in closet, storage and ensuite bathroom with Duravit fittings and Grohe accesssories. The apartment comes with a 55-square foot storage room on the basement level. 60 Tiffany Place is a pet-friendly, elevator boutique condominium in a converted 19th century warehouse. The building has a gym, bike storage and offers a free shuttle bus service during peak hours to and from Borough Hall (subways 2, 3, 4, 5, N, R, W). It is currently zoned for PS 29 in Cobble Hill. Residents of the area enjoy Brooklyn's beautiful waterfront, local parks and green spaces, including Brooklyn Bridge Park, Brooklyn Greenway and Van Voorhees and Cobble Hill Parks. For convenience, there is a Fairway supermarket, IKEA and ferry to Wall Street nearby. Additional neighborhood amenities include restaurants and cafes like Alma, Popina and the Longshoreman and shops and boutiques.